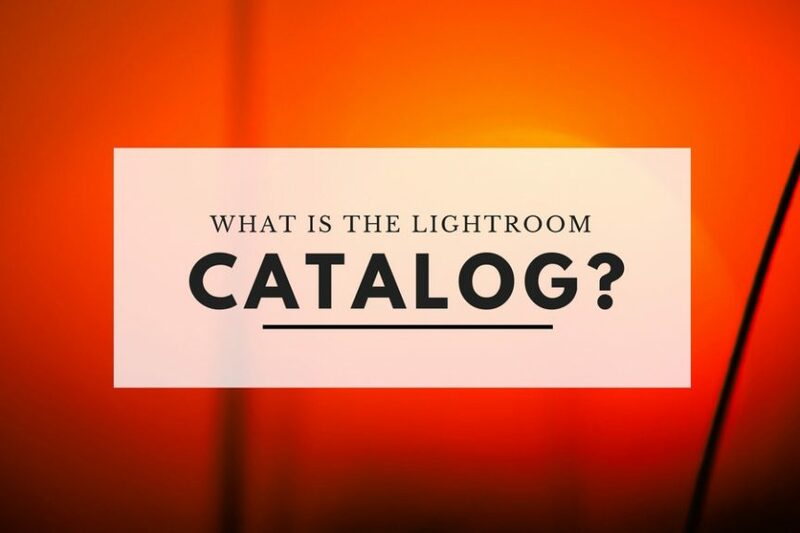 If you’re new to Lightroom it’s important to understand exactly what the Lightroom Catalog is. 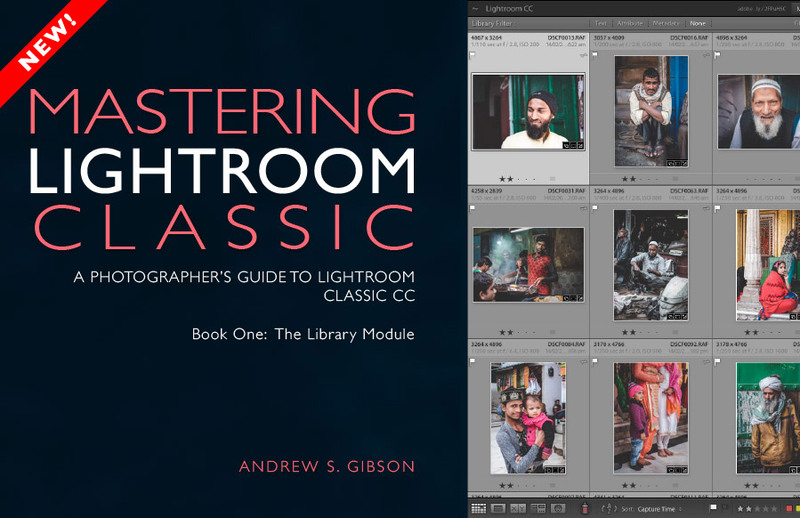 In turn this will help you understand how Lightroom differs from programs like Photoshop, and the benefits of the Lightroom way of working. It will also help you avoid some of the common mistakes and assumptions made by first time users. Why is Lightroom different from other programs like Photoshop? 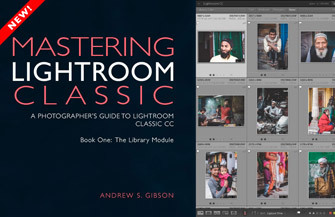 Lightroom is different from programs like Photoshop (by which I mean all versions of Photoshop including Photoshop Elements) because it is a complete digital asset management and workflow tool. 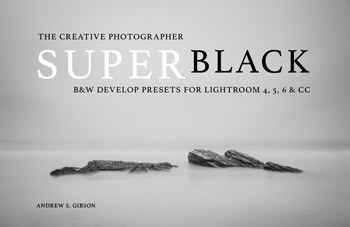 Lightroom organizes, searches and exports photos in book or web page form as well as developing them. It is so good at all of these that it might easily be the only program you ever need. Photoshop, on the other hand, only does one thing – develop photos. If you want to do something with them, like create a web gallery or a photo book, you need more software to do so. If you want to organize or search those photos you need yet another program (Photoshop users are probably familiar with Adobe Bridge, which came along before Lightroom and is still in use). 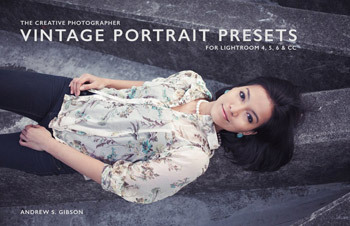 The Lightroom Catalog is a database where Lightroom stores all the information that it has about your photos. That includes the folders where they are saved, metadata (such as camera settings and keywords) and any developing you have done. One of the key differences between Lightroom and Photoshop is that Lightroom saves a list of everything you do to a photo, including developing, in the Catalog, leaving the photo itself untouched. Photoshop updates the file itself every time that you save your work. Lightroom is able to do this because it lists any changes you make as a series of text commands (or parameters) in the Catalog. This is known as parametric image editing. Programs like Adobe Camera Raw and Capture One work the same way. Lightroom Develop Presets are also parametric. A Develop Preset is nothing more than a text file containing parameters. You can open one in a text editor to read it. Here is an example. The crucial parameters are circled above. 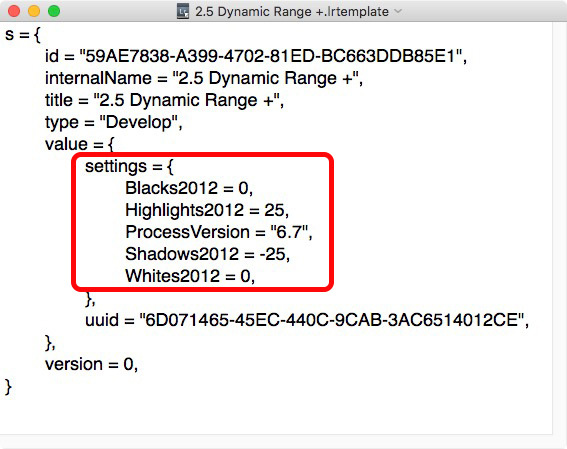 They tell Lightroom to set the Blacks and Whites sliders to zero, the Highlights slider to +25 and the Shadows slider to -25. These simple text commands can be applied to any photo in the Lightroom Catalog. The default location for the Catalog is in the Lightroom folder in the Pictures folder (for both Mac and PC). The quickest way to find your Catalog is to open Catalog Settings (go to Lightroom > Catalog Settings on a Mac or Edit > Catalog Settings on a PC). Click the Show button next to Location (circled below) to open the folder containing your Catalog in Finder (Mac) or Windows Explorer (PC). Look in the folder and you’ll see something like this. Lightroom Catalog.lrcat This is the Lightroom Catalog, the database containing information about your photos. Lightroom Catalog Previews.lrdata Contains thumbnails for minimal, standard and 1:1 Previews. 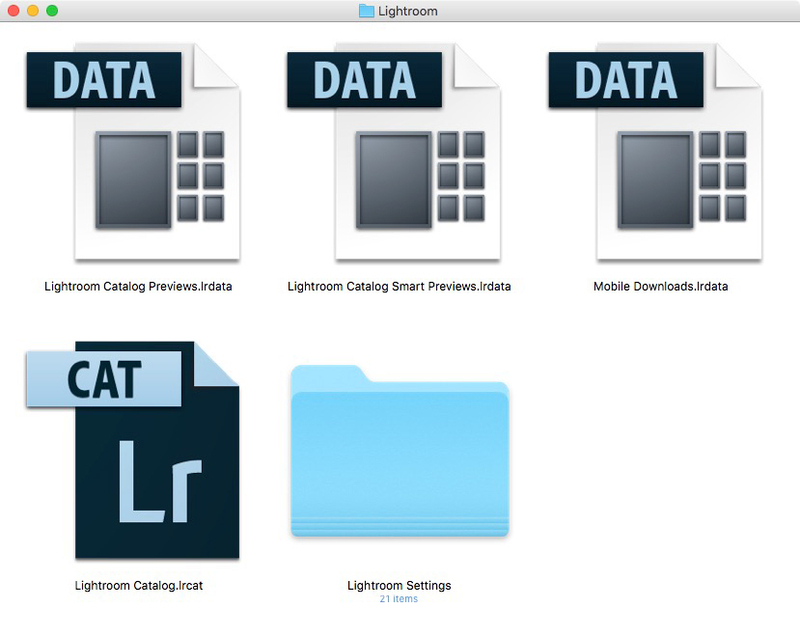 Lightroom Catalog Smart Previews.lrdata Contains thumbnails for Smart Previews (read The Ultimate Guide to Using Smart Previews in Lightroom to learn more about Smart Previews). Mobile Downloads.lrdata This folder contains any photos downloaded from a synced phone or tablet. You can change the folder where these are saved by going to Preferences > Lightroom mobile > Specify location for Lightroom mobile images. It also tells Lightroom which photos have been synchronized with Lightroom mobile, and where to find the Smart Previews for them. The last three are files on a Mac (that can be opened by right-clicking and selecting Show Package Contents) or folders on a Windows PC. That covers the basics, but there are a few more things you need to know. 1. 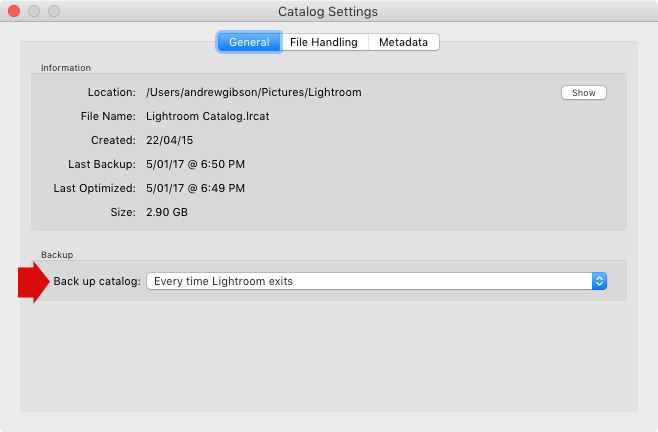 The Lightroom Catalog doesn’t contain any of your photos. Some photographers think that their photos are stored in the Catalog itself. It’s easy to see why this misunderstanding occurs, as the Import process implies your photo files are added to the Catalog. So let’s take a look at what actually happens when you import photos into Lightroom. 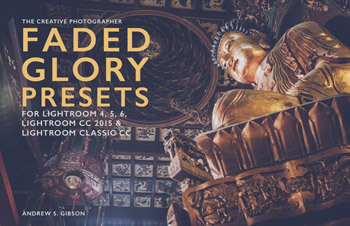 Lightroom adds information about the imported photos to the Catalog. This includes the folder they are saved in and metadata (camera settings, copyright information etc.). Lightroom builds previews so you can see view the photo. Always remember that your photo files are not saved in the Catalog. The best place for them is an external hard drive (see How to Organize Photos for Lightroom). 2. You should only use one Catalog unless you have a good reason not to. Users of earlier versions of Lightroom reported a slow down in performance when they added too many photos to the Catalog. Adobe has improved the Catalog performance since then and now reports you can add over a million photos to the Catalog without making Lightroom slower. Now it makes sense to import all your photos to a single Catalog, and organize them using Collections and Collections Sets. This is the only way you can view and search all your photos, as Lightroom only lets you open and search one Catalog at a time. So, what are some good reasons to use multiple Catalogs? Multiple Catalogs may suit high volume shooters (like wedding and sports photographers) who need to archive older images and don’t want them in their current Catalog. Some photographers may need separate Catalogs for personal and business use. If a photographer practices two types of commercial photography (say wedding and product photography) it might make more sense to have a separate Catalog for each one. Back up your Catalog regularly to avoid losing it (and the results of all your hard work) to hard drive failure or theft. The default location for back ups is in the Lightroom folder. This is not a good place for it – if the hard drive fails you will lose both Catalog and back up. The best place to save the Catalog back up is the external hard drive that contains your Raw files. You’ll get the option to change the backup folder when you close Lightroom. Click the Choose button in the Back Up Catalog window (shown below). Tick the Test integrity before backing up and Optimize catalog after backing up boxes. This helps ensure your Catalog remains corruption free and is optimized for speed. I recommend setting Back up Catalog to Every time Lightroom Exits. 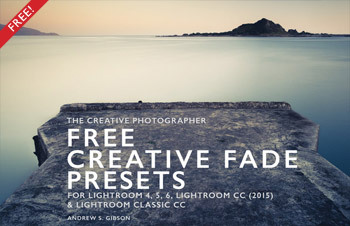 Some photographers find that Once a week, when exiting Lightroom is enough. You can also set the frequency of backups going to Lightroom > Catalog Settings > General > Back up catalog on a Mac or Edit > Catalog Settings > General > Back up catalog on a PC (see below). The Backups folder can fill up quite quickly, especially if you are a frequent Lightroom user. You can safely delete old back ups. I suggest keeping the two most recent back ups. You can delete the rest. If you are using Lightroom 6 or Lightroom Classic Lightroom compresses the back ups, saving hard drive space. Lightroom 6 and Lightroom Classic also give you the option of changing the frequency that you back up your Catalog every time you quit Lightroom. This option isn’t available in earlier versions. Lightroom 6 and Lightroom Classic use a different database structure for the Catalog to allow for metadata related to face detection. When you upgrade to either of these Lightroom creates a new Catalog file from the old one. It’s a good idea to back up your Catalog first in case something goes wrong. You may also like to regularly back up your Catalog to a third, cloud-based location like a Dropbox account. The Lightroom Catalog makes it much easier to organize and search images, as well as develop them. 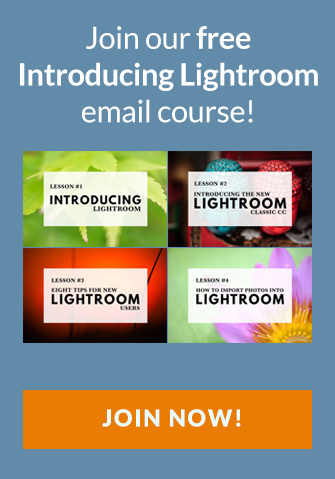 This benefit is so great that Lightroom has become the digital asset management and developing tool of choice for many photographers. If you haven’t used Lightroom before, trust me when I say that Lightroom will change your life by putting you in complete control of your photos. Any reason to be concerned about the size of my LR catalog? Hi Scott, the message is nothing to worry about, apparently it’s a bug that will be fixed in the next release. There’s some more information about it here. Hi. Thanks for the article. I work with both a pc and a laptop. I just bought an external hard drive to transfer all my photos from the pc so I can work on any of my photos from either the pc or the laptop. Shall I have all the photos, the catalogs (for different types of photography) and the back ups on the external hard drive then? Hi Ludo, this is a great question because there are lots of ways you could do it. If you were using Lightroom on just one computer it would be easy. Keep your photos on an external hard drive, and the Catalog/s, presets etc on the internal drive. Internal drives are faster than external ones so this helps Lightroom run more quickly. With two computers its slightly different and the simplest solution may be to keep the Catalog/s and the photos on the same external hard drive. A second option is to save the Catalog plus Smart Previews on an external Solid State Drive, and keep your photos on a separate hard drive. This will help Lightroom run faster especially if you have a USB 3 connection. There are other options too – you could use Dropbox to sync the Catalog between both machines, export Catalogs to your laptop from your main computer, or use Lightroom web from your laptop (if you’re a CC subscriber) and want to view and rate photos rather than Develop them. Hi Judy, it sounds like you’ve started a new Catalog for the second F drive. 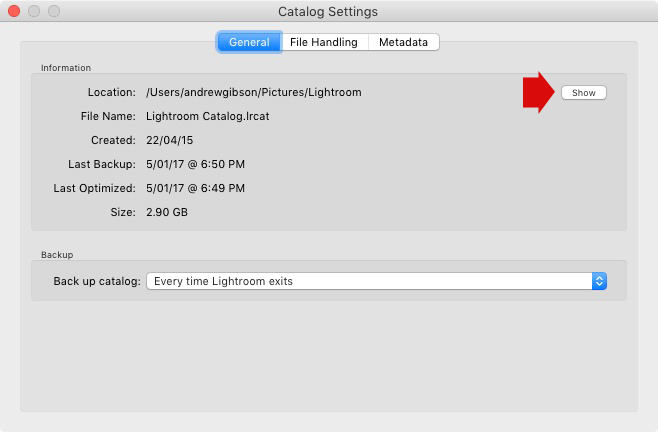 There’s no need to do that, Lightroom can handle multiple hard drives and it’s best practice to keep all your photos in a single Catalog. From what you’ve described it sounds like your photos are backed up, so if one hard drive fails you still have copies on the other. Thanks for responding, I don’t recall starting Catalog 2 on the second drive. How can I remedy the situation? Thanks!! I am not computer savvy if you couldn’t tell. Thanks, but it doesn’t make sense. On the original EHD there are lcat and all the other associated files including a folder called lightroom photos and the EHD is full. On the second EHD I only see lcat2, judys photos and no lightroom photos folder. Wouldn’t merging them cause the second EHD to be full??? No matter what I read, I have yet to understand the system. I have found no good non tech explanation. I think I will have to take my laptop and 2 EHDs to someone and ask and see the explanation first hand. Hi Judy, no, merging Catalogs won’t fill the second hard drive. Remember that the Catalog doesn’t contain any photos, just information about your photos. It’s a database, nothing more. Hope that helps. J’allége mon disque dur chaque mois en stockant mes photos sur un disque dur externe (depuis 2016). Chaque fois que l’on sauvegarde le catalogue LR (pour moi une fois par semaine) il y a bien accumulation des données depuis le début de l’utilisation de LR (2016). Autrement dit le catalogue juste enregistré contient-il bien toutes les informations de mes 21000 photos depuis 2016 (photos qui se trouvent sur le disque dur interne pour les récentes et sur le disque dur externe pour les plus anciennes) ou bien juste celles qui correspondent aux nouvelles photos du mois ? Bonjour Monique, chaque sauvegarde est une sauvegarde complète de votre catalogue. Je vous recommande de conserver les deux fichiers de sauvegarde les plus récents et de supprimer le reste, vous n’en avez pas besoin. Cela vous aidera à libérer encore plus d’espace disque.